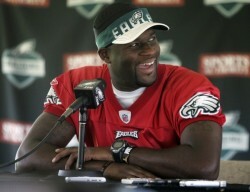 For the second straight year the Buffalo Bills offered quarterback Vince Young a contract. This time he took their offer. It's for one year and $2 million with another $1 million possible in playtime bonuses according to ESPN's Chris Mortenson. It's not known if Young also has an incentive to avoid the use of 'dream team' to describe his new job. Young spurned the Bills to backup Michael Vick last year with the Eagles, signing a deal worth $3.5 million and going 1-2 in three starts with four touchdown passes, nine interceptions and a 60.8 passer rating.